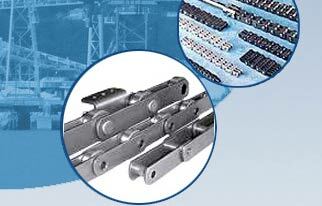 Conveyor Systems from Draton reduces production cost, enhances product quality and increases safety measures. The company aims at offering material handling solutions that shoot production graphs and increase efficiency. Thus, Draton conveyor systems are safer, smooth in running and trouble free to handle any movement of materials, across industries. Manufactured of EN series material, SS, cast iron etc., & in compliance to defined standards the array includes small series chain, redler chain, slat bent chain, leaf chain, crank design chain etc. Bucket elevators, chain conveyors, screw conveyors, belt conveyors, redler chain conveyor, wire mesh and more catering to diverse material handling needs of multiple industries. Precise in construct & efficient in operation, our sprocket - wheels, coupling, PIV / speed variators, pulleys, seamless buckets etc., are best for power transmission requirements. Worm reduction gear boxes, helical gear reducers, geared motors are best suitable for material handling equipment. The smooth performance and durability of these gear boxes & motors are appreciated by industrial-users. Variety of Conveyor Idlers offered includes troughing idler, rubber disc idlers, return idlers, troughing training idlers, flat belt training idlers and more.